Fun game asks you to guess if a domain is registered or not. GoDaddy released a fun (and rather eye-opening) app at NamesCon today called Bought Or Not. Bought or Not is similar to hot or not, except players guess if a domain name has been registered or not. It’s available online at BoughtOrNot.com and as an iPhone app, with Android coming soon. GoDaddy is giving away prizes if you play the game at its booth during NamesCon. A group of GoDaddy interns came up with the idea over the summer. GoDaddy has about 40-50 interns across all of its offices each summer, and they get together for a week at the headquarters in Scottsdale. They have a hackathon during their time in Arizona. GoDaddy Chief Architect Arnold Blinn worked with a team of interns to build Bought or Not, which won the hackathon. The company also filed for a patent covering some of the app’s functionality, and the interns are named on the patent. What’s eye-opening about the app is that it can be quite difficult to determine if a domain name has been registered or not…which means there are a number of good domains available. 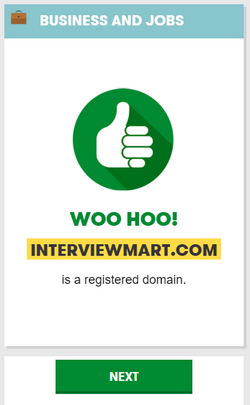 If a domain is available, you can click through to register it. Some of the unavailable domains are available on the aftermarket and can also be purchased. Another cool feature is that people can hook the app up to a different backend of domain name choices. It might be fun for a new top level domain name company to hook it up to one of their TLDs.